In August, ffg announced lieutenant packs for Descent 2nd edition. As I've heard from my undisclosed moles, there are currently no further expansions in the pipe, so lieutenant packs is the current way Descent 2nd Edition goes. Aside from the beautifully crafted figurines (albeit plastic), what's your thoughts on the real content? A game changer? 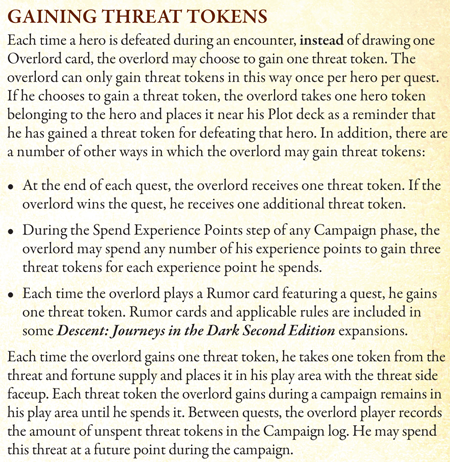 What do you think about plot cards (like a custom Overlord class deck with bias to upgrade cards) and the reintroduction of threat tokens? Good idea? Has ffg also thought about addressing the Overlord's issue of reduced chances of getting purchased arsenal cards on hand as the campaign progresses? ... lots of questions so far! The problem with these packs is that I can't even begin to review them without knowing what exactly the fortune tokens do. Dependent on the strength of their benefits, it could single handedly make or break these decks. Look like a strong supplement to (but not a replacement for) the OL deck. The total threat you can amass is limited. You don't want to run out of "ammo" for your fancy plot cards! The mechanics of threat tokens is to activate OL cards, what mainly appears to be upgrade cards at first glance. I find that quite interesting since they simplified the OL in Descent 2nd Ed. (compared to Descent) to only use one type of resource, namely Overlord cards. With now reintroduced threat and a handful of tokens to activate some cards of the lieutenant deck, this seems like a good trade-off between simplifying accountant-work and still getting the original Descent level of suspense "just you perky heroes wait till I get my third token..."
I just hope this is all flawless and well-conceived, and these decks can be mixed with the OL classes available. As with anything of this nature, if you're hoping for flawlessness, you will be disappointed. Actually wouldn't surprise me at all with their track record. But I think it was more there's nothing on the table right now. Not that they are never going to again. If true, I'm OK with this. I only have a couple of quests from the LoR campaign under my belt, so there's still so much more to discover there. And if you can believe it, there are still quests from the base game that I haven't tried yet. I'm seriously thinking about holding off on The Trollfens until I've digested most of what I've got already. Your moles are deaf and blind. Perhaps the moles are just under strict non-disclosure agreements. I would be happy if they released some "Class Packs" which contained new classes 1 for each archetype. Currently that is what is getting stale. I look forward to Trollfens for the prophet and stalker classes. We have 14 classes already and you say it's getting stale? Maybe instead they should introduce a way to spice up already existing classes. Not by adding class specific cards, but by adding supplementary mechanism, similar to what lieutenants packs will do to OL. Well I have played through the Shadow Rune Campaign at least 8 times and LoR twice. I haven't currently played the Treasure Hunter or Hexer more than once. But yes I do feel like it is getting stale. I don't think the idea of new classes is such a bad idea. You really have a lot of free time then. Have a pause and try different play groups next time. What mostly could spice things up is a campaign book. What does my free time and my play groups have to do with classes being stale? Also how would another campaign make using the SAME classes less stale? If the classes will have to work differently in new scenarios then they will be less stale. Too bad the classes are so limited in development and options that they are 1 use only for some players. Adding a mechanism that would add new options to every class would change all of them, basically giving us twice the amount of classes we have now. Just adding new classes? Nah. Just adding more classes without end will be stale. Nah. Just adding more classes without end will be stale. Yeah, well, ya know that's just like, uh, your opinion, man. Yes, it's my opinion. If they make pack of 4 classes, as you want, then you'll use them up in single campaign if you'll play with 4 heroes. 2 campaigns if you play with 2-3 heroes. Even if you want to play each class personally then this gives you only 4 campaigns. On the other hand if they make something that would bring life to all existing classes you get 4-16 campaigns of new content. No matter how fast their dish out new classes, seeing from how quickly you get bored of them, you'll always end up wanting more long before they are able to deliver. Another vote for the campaign book. This is the one that requires most development. Something akin to prestige classes could be cool — unique skill cards tied to archetype but not to any specific class. I like that idea a lot. It'd be hard to make them inherently useful for every class, but with clever mechanics you could get something interesting. Maybe for wizards something like: Time Warp (2 fatigue): Refresh an exhausted class card. More classes is not something I want to see. Small additions to it - fine, but do not expand already big base. There is one thing that is missing - which FFG was already using in other games - random map generator. Campaign book will be good one. Maybe some other starting weapons for the heroes. An expansion which allows exploring, and making D2 a dungeon crawler would be great ! Even some replacement of the OL by a good AI could diversify the game and perhaps make it the best dungeon crawler around, while keeping its basic tactical skirmish aspect. What's your idea of a boardgame AI? Gears of War is one example — you draw cards that make the various Locust types perform particular actions based on the closest player figure to them, alternate actions if primary condition can't be fulfilled, etc. Works very well. Something similar could work for Descent, but it would need to be more complicated. There are more variables in D2E than in GoW; that game doesn't have OL cards with conditional triggers, nor objectives for the Locust other than "kill the good guys." Arkham Horror also has a (light) AI system at work when it comes to monster movement — monster symbols + black and white paths + special movement rules for some monsters.